Mike Sorrentino is an awful person. So awful that people are now paying him to not be associated with them. Clearly, Abercrombie is run by a bunch of idiots. This story is blowing up twitter and the interwebs right now. Nobody can utter the word Abercombie without thinking of Jersey Shore and The Situation. CNBC just ran the story. Good call, Abercrombie. Guess what? I’m connected. I’m in the loop. My wife gets People Magazine. I run a real awesome blog… and I had no clue that this idiot wore your clothes. I’d have bet the farm he only owned Affliction and Ed Hardy tees. Now? My assumption is that when he’s wearing clothing… they are A&F head to toe. Wait, is that what’s going on here? Are you mind effing all of us, Abercrombie? Is this your ploy? You WANT to be associated with the Jersey Shore, don’t you? It’s like the most popular show on TV, right? Little Situation wannabes are gonna be coming out of the woodwork, storming a mall near you buying up all your A&F clothes. You sneaky bastards. Tell ya what… as my boy LT pointed out, if you really wanted to disassociate yourself with somebody… you might want to pay Yahoo! Sports to take this picture down as the top image on the story of the summer. Because if there’s anybody slimier out there than The Situation, it’s Uncle Nev. 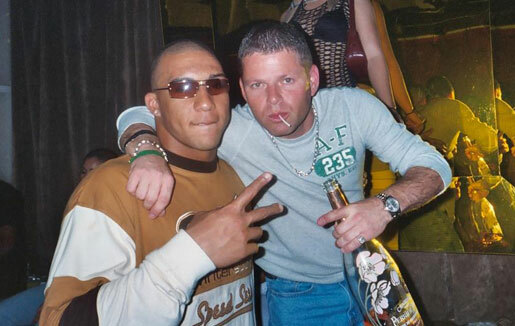 The U of Miami Scandal: Nevin Shapiro and a second source said this photo of the booster and Kellen Winslow Jr. was taken in Shapiro’s VIP section of Opium Garden nightclub in 2003. Just a thought, ya jackwagons. This entry was posted in Celebrities, Fashion, News and tagged A&F, Abercrombie, Fitchuation, Michael “The Situation” Sorrentino, Mike Sorrentino, The Situation. Bookmark the permalink.